Russia, which has a strong tradition of wrestling excellence, is now producing sportsmen who are making a big impact in mixed martial arts. When, a few years ago, I sat down to interview Chuck Norris, the actor and martial artist surprised me by gushing about Russia’s future in the still-exotic sport of mixed martial arts (MMA). Norris was at the time busy with his now-defunct World Combat League and his dream was to have a Moscow-based team composed entirely of Russian fighters. Coming from a man who had traded roundhouse kicks with Bruce Lee, one would be hard-pressed to find higher praise. But had Norris ever tried to fulfil his dream of expanding his MMA promotion to Russia, he may have been surprised at the relative lack of popularity or understanding of the sport among the public. Even now, with Russia producing numerous top-rated fighters, exposure remains a challenge for local MMA enthusiasts. However, while many Russians still cling to the old Soviet notion about the sport as a barbaric and evil western contagion, attitudes are beginning to change, in large part thanks to Emelianenko’s international fame. None of this should be surprising, though, considering Russia’s rich history of mixed martial arts. 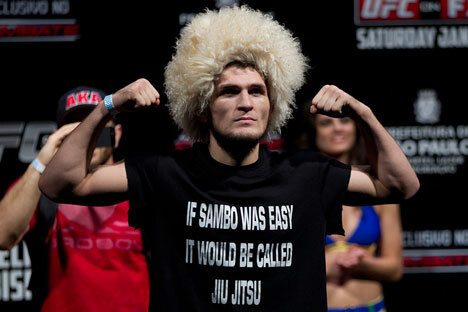 In fact, Russia’s very own contribution to combat sports, sambo, is a mixed martial art all in itself. If this makes Russia’s all-too-recent attitudes about modern MMA puzzling, it helps to understand that sambo has always existed in two distinct varieties: as a sport and as a combat technique, both quite different. Developed in the Twenties and Thirties as a Red Army hand-to-hand combat training technique and then as a wrestling code, sambo (an acronym, which, translated from Russian, means “self-defence without weapons”) is rooted in judo with many elements of traditional ethnic styles of wrestling borrowed from the Asiatic peoples of Russia’s East. Central Asia’s kuresh and Mongolian khapsagay, both ancient and complex grappling styles perfected by nomadic warriors, seem to have made major contributions to sambo. The sport’s founder, Anatoly Kharlampiev, spent a long time travelling in the East and researching local styles of wrestling with the aim of incorporating them into his creation. Sambo has proven to be a perfect foundation for developing elite MMA talent, with all the major Russian fighters emerging from the local sport. While sambo as a wrestling style may be obscure in the West, its combat version, used by Russian elite troops and special forces, is widely respected as one of the best all-around fighting systems ever developed. Using a grappling and throwing technique, especially one as well-developed as Sambo’s, as the foundation makes perfect sense for Russia, where so many wrestling styles have flourished. For the people of Northern Caucasus, for instance, wrestling is both an obsession and a rite of passage, which greatly contributes to Russia being one of the world’s major powers in freestyle wrestling. It is no wonder that in the 2014 Russian MMA Championship, 21 out of 24 medal winners were ethnic Northern Caucasians. All of them started in wrestling and moved on to MMA through sambo. Of course, practitioners of combat sambo already know how to use their fists and feet to devastating effect, in addition to holds and throws, as anyone unfortunate enough to get on a Russian paratrooper’s bad side would know. Emelianenko, Sergei Kharitonov and other Russian MMA heroes have all emerged from this ruthlessly efficient martial art. It is also where the current Bellator MMA heavyweight champion, Vitaly Minakov, learnt his craft. Minakov, incidentally, loves to knock out his opponents with a barrage of punches, something that should made Chuck Norris, the noted opponent of the grappling style, quite happy. With regard to popularity among the masses, like many things in Russia it seems to follow the whims of the powers that be. Until recently, MMA was purely a commercial enterprise, operating without any help from the government. But now, with Emelianenko as the head of the Russian MMA Union and a member of the State Duma, things are sure to look up. With his own legend showing the way, Russian government financing and a mob of eager youngsters well-trained in the country’s cherished and fearsome martial art, Fedor Emelianenko is not likely to renege on his promise.